For centuries, master herbalists have known that men have unique needs, and that certain herbs work to balance and support normal masculine function and improve wellness and vitality. GNLD's Masculine Herbal Complex contains 9 herbs in a beneficial, which serves as herbal medicine, balanced mix together to support normal masculine function and improve wellness and vitality. 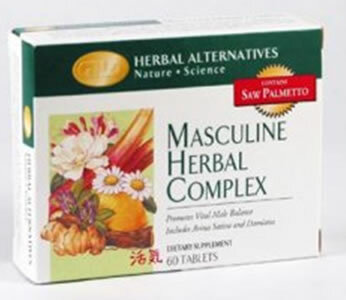 Masculine Herbal Complex having Saw Palmetto which promotes male vitality and has been shown to support prostate and urinary tract health, and also containing Avena Sativa for renewed physical vitality and libido, and Damiana, a tonic for the nervous system, also known to energize mood. Saw Palmetto − fruit (Serenoa serrulata/repens) (5:1) Maintains a healthy urinary tract and prostate. 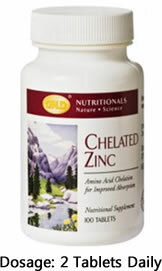 Supports a strong immune system and restores vitality. It has some anti-diabetic activity. Oats − seed (Avena sativa) (10:1) Helps relieve feelings of stress and anxiety. Supports healthy nervous system, libido and related male functions. Helps relieve feelings of stress and anxiety. Is used for nervous exhaustion and associated depression. Damiana − leaf (Turnera diffusa) (6:1) Supports healthy nervous system, libido and related male functions. Aids in control of stress and anxiety. Reduces urinary irritation, incontinence, and chronic urinary infections. Yarrow − flower (Achillea millefolium) (6:1) Supports healthy blood pressure levels. Soothes and calms, normalizing distressed tissue. St. John's Wort − flower (Hypericum perforatum) (6:1) Calms the nerves, relieves mild depression. Also helps soothe and normalize distressed tissue. Reduces inflammation. Skullcap − herb (Scutellaria lateriflora) (5:1 Calms the nerves, reduces feelings of anxiety and stress. Helps support healthy blood pressure levels. Astragalus − whole plant (Astragalus membranaceus) (4:1) Promotes vitality and healthy immune responses. Traditionally used to stimulate kidney, liver and endocrine gland function.